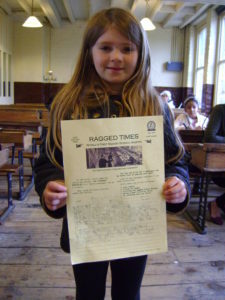 June Half Term Activity Days here at the Ragged School Museum were entitled Children of Victorian Stories and also marked International Children’s Day celebrated on the 1st of June. For those of you who have not read the 1868 novel Little Women by Louisa May Alcott, The Pickwick Portfolio is a newspaper ran by four sisters featuring their stories, poems, articles, and drawings. This inspired Jennie, the Museum’s Education Officer, and I to create an activity based on a newspaper produced by children. 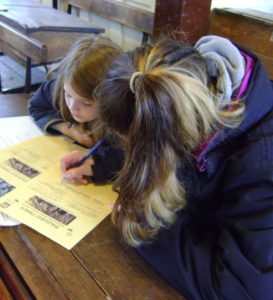 The children who took part in the activity wrote their own stories and drew pictures based on scenes from Charles Dickens’s Oliver Twist and Charlotte Brontë’s Jane Eyre. Reading Victorian texts can be a little tricky for anybody, particularly for children and non-native speakers of English, thus I was mindful of the language and lengthy sentences of the scenes selected for the activity. In order to bring these touching stories to life for the children, it was essential to make sure they understood them first. During the activity, I read out the scenes or asked the parents to do so, and as I was reading out (and putting on different voices! ), I asked the children to close their eyes and imagine every word. There were many unfamiliar words to them which I explained whilst reading out as well as in a brief glossary. It was also useful to show them different interpretations of the same scene through the illustrations of George Cruikshank and Harry Furniss for instance. The scene in which Oliver asks for more gruel is a popular one amongst young audiences via films, pictures, theatre or school performances. They did prefer Oliver Twist over Jane Eyre although not all of them were acquainted with the stories. A very few of the older children had heard of the latter and were fascinated to learn that this year marks the bicentenary of Brontë’s birth. However, regardless of the children’s varied reading and drawing abilities or prior knowledge of the texts, what is most significant is that they all creatively engaged with both. Their pictures and stories which are now published in the paper simply speak for themselves! Here is the first page of the children’s newspaper alongside the one used in the activity as a visual prompt which includes authentic Victorian articles and illustrations extracted from Dr Barnardo’s publication Night and Day. Enjoy your reading!